III. WHICH ONES ARE BEST? IV. IS A CANNED FOOD REALLY HEALTHFUL? VI. WHY DO SOME PEOPLE DISLIKE SARDINES? Named after the Italian island of Sardinia, Napoleon popularized sardines by making them the first fish ever to be canned. Although still usually found in those flat metal cans, this humble little fish is surprisingly nutritious. Of course, they are very small fish that live in the oceans of the world, particularly the Atlantic Ocean. Some people even go on a Sardine Diet because it not only regulates weight but is also designed to revitalize your general well-being. 1. A Very Yang Fish. Sardines are more yang because they are very small, compact, and dense fish. We also prefer those from cold waters, if possible, as these are also more yang. We also like them smoked and in oil, also to make them more yang. The best brand is Chicken Of The Sea Smoked Sardines In Oil. Bela brand is also very good, and most others are okay, but not quite as good. Those who read this website know that I only recommend more yang foods. This is because the bodies are all extremely yin. Eating yin foods make the bodies much less healthy, no matter what nutritional benefits the food or supplement offers. all fruit except a few dried botija olives per week. “green superfoods” except for kelp capsules. coconut products (a sub-tropical fruit). fermented foods except a little miso, a little cheese, and a little yogurt or kefir if you like. These are not required foods. The small size of the sardine means that it has less opportunity to pick up and accumulate mercury. The skinless and boneless sardines are even lower in mercury, with up to 50% less mercury than regular sardines because apparently the mercury concentrates in the sardine’s spinal cord that is removed in the boneless ones. However, the spine supplies excellent calcium and the spinal cord supplies excellent nervous tissue. The skin also provides an excellent form of selenium. Therefore, I do not recommend the boneless and skinless sardines at this time. All larger fish, even salmon, concentrate mercury up to a million times more than the lowly sardine. I do not agree with some health authorities who recommend some of the larger fish. They are nutritious, but they are very high in mercury and I find the mercury shows up quickly on hair mineral tests if one eat even one serving of salmon per week, for example. To read more, please read Mercury on this website. Everyone needs more omega-3 fatty acids in their diets due to the use of processed vegetable oils in foods, and feeding livestock on corn, rather than pasture land. Sardines are a wonderful source of high-quality omega-3 fatty acids. To read more about this topic, please read Omega-3 Fatty Acids on this site. Everyone over about the age of 6 or 7 needs more vitamin D. Sardines are a rich source of this very essential vitamin. To read more, please read Vitamin D on this site. Sardines are also a good source of the other fat-soluble vitamins such as vitamin A and vitamin E. Vitamin K comes mostly from vegetables. Sardines provide a complete and balanced protein that is easily utilized by human beings. Sardines are rich in purines. These are nucleic acids that are proteins needed to rebuild body tissues. For fast oxidizers, in particular, they can balance the oxidation rate. However, they are good for everyone. 7. A Good Source of Many Minerals. 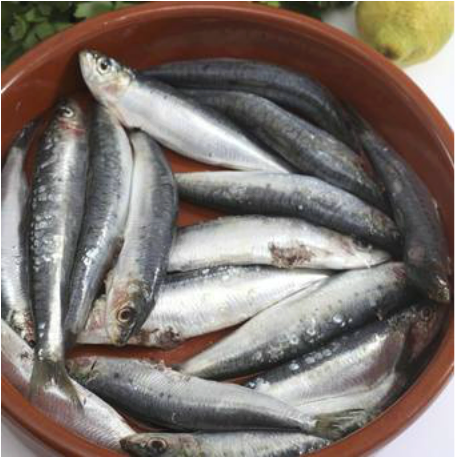 Sardines offer many minerals, among them calcium, magnesium, phosphorus, selenium, iodine, zinc, and others. Buy the sardines that still have the bones and the skin. Then you will get a fine source of calcium. There are few others, such as raw dairy products, some cooked vegetables and some nut and seed butters. The skin, and the whole fish, are high in a very bioavailable form of selenium, an important mineral today for everyone. There are few sources as good or as tasty. Co Q-10 is a very essential nutrient that most people do not get enough of. It is required for energy production in the cells, and is especially important for the health of the heart and the brain. Sardines are among the richest food source of coenzyme Q-10.8. Healthful Organ Mat and Nerve Tissue. Even the spinal cord and organs of the sardine are very healthful in moderation. If one eats larger fish and other animal foods, these are removed. However, animals know that a little organ meat is superb for one’s health. Unfortunately, most portions of organ meat today are too contaminated with toxic metals, but a little is fine. Most all sardines are still caught with nets in the ocean. This means they eat what they like, swim where they wish, and are a lot healthier and cleaner than most fish sold today. Most fish today are farm-raised. A few fish farms are quite health-conscious. Many are not healthful places at all – fish lie almost motionless surrounded by their own urine and feces until they are harvested. I would never eat any farmed fish, no matter how attractive it looks. They can dress them up with chemicals, and this is standard in the industry. Development, as the word is used on this website, is a particular process that some human beings go through that enhances brainpower and the immune response. Sardines are one of the few foods on planet earth that contribute to this process. To read more about this amazing topic, please read Mental Or Spiritual Development on this website. Other developmental foods are quality eggs and meats, organic blue and yellow corn, mustard, and kelp, a sea vegetable. Others include most well-cooked vegetables, except for the night shade family of vegetables (potatoes, tomatoes, all peppers and eggplant). Other special developmental foods include most mustard, and a sea salt called Hawaiian Jade Sea Salt. Sardines are relatively low in cost, much less than other fish. They are also convenient because they come cooked and easily eaten. We find no problems with the aluminum or steel cans in which they are packed. The canned sardines are actually better preserved and therefore fresher than most “fresh” fish that are transported sometimes thousands of miles before they are cooked. These are the main reasons for eating sardines. Most adults need 3 to 4 cans weekly of the 3.75 ounce cans. If your cans are smaller, you will need more of them to get enough omega-3 fatty acids and vitamin D for your body’s needs. If you eat this many, do not take additional supplements of omega-3 fatty acids and vitamin D. Both sardines and the supplements are not needed. Adults need 3 to 4 cans weekly of the 3.75 ounce cans of sardines. These are the standard sized cans. If the cans are smaller, have a little more. If larger, have fewer. Do not have more than 3-4 canse weekly unless the sardines are boneless. This is because even sardines contain a little mercury, and too much is not good. Boneless sardines have less mercury, so it is possible to eat more safely. However, it is best to vary your proteins. This will supply enough omega-3 fatty acids and vitamin D, and this is a major concern. Warning. If you eat this many cans of sardines, do not take additional supplements of omega-3 fatty acids and vitamin D. You can easily overdo on omega-3 and vitamin D, and this is not desirable. Do not be misled by the fact that nutrition books say that a can of sardines only contains about 200 IU of vitamin D, whereas I recommend taking 5000 iu daily of a fish oil vitamin D supplement. The sardine vitamin D is far better utilized, so the 3-4 cans a week is plenty. 1. I currently favor Chicken Of The Sea smoked sardines in oil. These are cheap, tasty and smoking adds more nutrients and makes them more yang, as explained above. Packing them in oil also makes them a little more yang. They are also widely available around the world. 2. Other options. Bela is a good brand, as are others. Smoked sardines are very good. They can be packed in water, oil, or mustard. Those packed in tomato sauce or hot sauce are more yin and more irritating to the body. I would not buy these. 3. Children. Children under the age of about six or seven usually do not need extra omega-3 fatty acids and vitamin D. they can have a little sardine, however, if they like. From age six to eight, most children need about ½ a can of sardines a week to provide extra omega-3 fatty acids and vitamin D.
From age nine to 12, most children need about 1 can of sardines a week. From age 13-15, most children need about 2 cans of sardines per week. From age 14 and up, most teens can eat 3 cans per week. This is better than taking omega-3 and vitamin D pills because sardines offer so many other benefits. IS A CANNED FOOD REALLY HEALTHY? The answer is that most sardines in the can are quite fresh because they cooked quickly when caught. Fish tend to spoil quickly. So a can of sardines is actually far better than buying pretty-looking fish that have traveled sometimes thousands of miles before cooking. The nutrients are still present in the canned ones. Be sure the sardines you buy have not passed their expiration date. The fresher the better. Sardine cans are all coated on the inside so the sardines do not come into contact with the aluminum or steel can. Perfectly fresh sardines are impossible to find in America. Some Oriental markets sell dried sardines, and these are okay, but not as good, in fact. For those who want to watch their weight, sardines are also superb. They will fill you up, and keep you full for hours. WHY DO SOME PEOPLE DISLIKE THE TASTE OF SARDINES? Sardines taste a little fishy. The smoked ones and those in oil are less so. It is wise to learn to ignore the taste because this is one food that is extremely healthful. See below for toppings you can add to disguise the taste. Sardines make an excellent, high-protein, meal. Preferably eat a can of them all alone. This is called a mono meal. Otherwise, combine them only with cooked vegetables, with only these two foods at the meal. Combining them with tortillas, bread, corn chips, or other grain at the meal is not nearly as good a food combination and will impair digestion. Spice them up with sea salt, garlic powder, a little cayenne powder, ginger, oregano, thyme, rosemary or dill. Put some of your favorite mustard on them. Most mustard is a decent product, provided it is not loaded with sugar and too much vinegar. Mash them with a fork, add mayonnaise and some chopped celery and/or onions to make sardine salad. This is a little yin, but if it will help you eat sardines, it is not too bad. Many people cannot taste the difference between this and tuna salad. You could add mashed sardines to your favorite dip such as a bean dip. This is also more yin, but is okay now and then. Mix them with cooked vegetables such as cooked onions, which add sweetness and a strong flavor.